Inflammoscopy – cite! Inflammoscopy (message) Inflammoscopy – participate! In dermoscopy of skin tumors, the main dermoscopic structuresThis glossary term has not yet been described. result from deposition of pigment at several levels of the skinThis glossary term has not yet been described.. Vascular structuresThis glossary term has not yet been described. and other features are also seen, but they are usually considered less important as compared to pigmented criteriameasure of how well one variable or set of variables predicts an outcome. In contrast, in inflammatory and infectiousThis glossary term has not yet been described. entities the main histopathologic alterations are usually nit associated with pigment, but include cellular infiltrations, vascular structuresThis glossary term has not yet been described. and alterations of the thickness or the anatomy of the epidermis. Therefore, the selection of an equipment that preserves vesselsThis glossary term has not yet been described.’ morphologyThis glossary term has not yet been described. and enhances their optimal visualization is much more crucial when evaluating skin eruptions than tumors. The “old-fashioned” non-polarized hand-held dermatoscopes require direct contact of the optical lens to the skin surface, which may result in alteration of the morphology, or even disappearance, of the underlying vascular structures. Using for immersionThis glossary term has not yet been described. ultrasound gel instead of liquid offers the possibility of applying less pressure and better preserve the morphology of the vessels. However, this problem was radically solved by the introduction of the second-generation hand-held dermatoscopes, using polarized lightThis glossary term has not yet been described. and not requiring contact to the skin. In addition to eliminating the pressure problem, polarized dermoscopy offers also a better projection of vascular structures and allows the visualisation of white shiny structuresThis glossary term has not yet been described., which are hardly, or not at all, seen with non-polarised light. In consulsion, we strongly advice the use of non-contact polarised dermatoscopes when applying dermoscopy in general dermatology. Dotted vesselstiny pinpoint vessels. This category includes roundish vessels of any size, without discriminating among pinpoint, dotted and globular vessels, which anyhow differ only in the diameter. Quite frequently, dotted vesselstiny pinpoint vessels of different diameter are simultaneouseously present in the same lesion. Dotted vessels can be seen in the majority of the common inflammatory skin diseases. They have been initially described as the dermoscopic hallmark of psoriasisThis glossary term has not yet been described., but later it was shown that many other inflammatory dermatoses dermoscopically display dotted vessels, including dermatitisalso known as eczema is a group of diseases that results in inflammation of the skin. 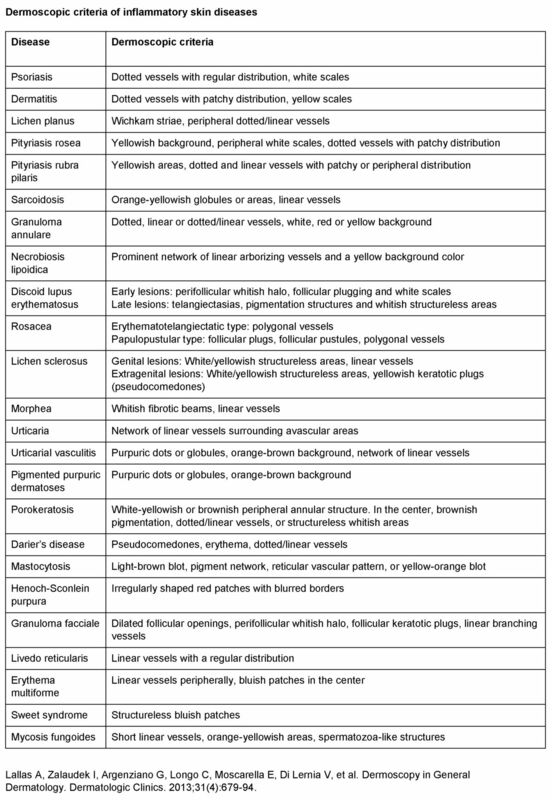 (all types), lichen planusThis glossary term has not yet been described., pityriasis rosea, porokeratosisThis glossary term has not yet been described. et al. Linear vesselsLinear mildly curved vessels considered irregular when different sizes shapes and curves with a haphazard or random distribution are presented and considered regular when short and fine (thin) linear vessels prevail various diagnoses, not curved and without branches. Linear vessels are very frequently present in sun-damaged skin. They are also seen in lesions of any disease treated with topical steroids for long periods. The most frequent skin disease characterised by linear vessels is rosaceaThis glossary term has not yet been described., which is typified by a specific arrangementThis glossary term has not yet been described. the vessels in polygonslines angulated or polygonal (non-facial skin) (polygonal vessels). Linear vessels with branches. They are somehow similar to the typical vessels seen in basal cell carcinomais the most common skin cancer, and one of the most common cancers in the United States. While BCC has a very low metastatic risk, this tumor can cause significant disfigurement by invading surrounding tissues. They can be seen in granulomatousThis glossary term has not yet been described. skin diseases (sarcoidosisThis glossary term has not yet been described., tuberculosis) and at the late stage of discoid lupus erythematosusis a chronic skin condition of sores with inflammation and scarring favouring the face, ears, and scalp and at times on other body areas. These lesions develop as a red, inflamed patch with a scaling and crusty appearance. The centre areas may appear lighter in colour with a rim darker than the normal skin.. Linear curved vesselscomma vessels - linear curved short vessels - dermal nevi monomorphous vessels: one type of vessel dominates. They are similar to the so-called comma vessels that are frequently seen in dermal nevi. They can be found in lichen planus, granulomatous disorders and also in mycosis fungoidesThis glossary term has not yet been described. Regular. This means that the vacslar structures are equally and homogeneously distributed all over the surface of the lesion. This vacslar arrangement typifies psoriasis. Peripheral. Vascular structures are distributed mainly at the peripheral part of the lesion. This arrangement is frequently seen in lichen planus. Patchy. The vascular structures are arranged randomly without following any specific pattern. It is also called asymmetric or unspecific distribution. It can be seen in many diseases, such as dermatitis and pityriasis rosea. In plexus. The vascular structures form a kind of networkThis glossary term has not yet been described.. This arrangement can be seen in psoriasis (dotted vessels) and is also very characteristic of rosacea (linear vessels). White. This is the most frequent scale colour and can be found in most of the erythematosquamous and papulosquamous skin diseases, such as psoriasis or lichen planus. Yellow. Yellow crusts are a result of serum extravasation and yellow scales a result of serum mixed with keratin. Yellow crusts and scales represent the dermoscopic hallmark of all types of dermatitis, corresponding histopathologically to the underlying spongiosis. Diffuse. Scales covering all the surfaces of the lesion. It cannot be considered specific of any diagnosisis the identification of the nature and cause of a certain phenomenon. Diagnosis is used in many different disciplines with variations in the use of logic, analytics, and experience to determine "cause and effect". In systems engineering and computer science, it is typically used to determine the causes of symptoms, mitigations, and solutions, since diffuse scales can be seen in several hyperkeratotic dermatoses. Central. Scales accentuated in the centre of the lesion. Again, this scaling pattern cannot be considered as specific, although it is quite frequently seen in psoriasis. Peripheral. Scales sparing the center and distributed mainly at the periphery. It is a classic sign of pityriasis rosea, but can also be seen in tinea corporis and other entities. Patchy. Random and asymmetric distribution of scales. May be seen in several diseases. Perifollicular white halo. A white-colored circle surrounding each hair follicle and/or filling the space between follicles. It might correspond either to perifollicular fibrosis (ex. discoid lupus erythematosus) or to epidermal hyperplasia (ex. hypertrophic lichen planus). Perifollicular pigmentation. Pigment accentuated around the hair follicles. It can be seen in some alopecias, but also represents the first sign of re-pigmentation in vitiligo. Follicular depigmentation. Loss of pigment in the hair follicles, as compared to the surrounding skin. It represents an early sign of active vitiligo, but can also be found in other causes of hypopigmentation. Specific clue is considered a feature that, when present is very strongly suggestive of one only diagnosis. Therefore, specific clues are features that can be seen only in one disease and not in any other entity, especially in those included in the differential diagnosis. Specific clues have been suggested for several diseases, but only a few have been investigated in appropriately designed studies that included control groups. Examples of specific clues are the white crossing ines of lichen planus (Wickham striae) and the peripheral keratotic rim of porokeratosis. Dotted vessels represent the most frequent dermoscopic feature of Psoriasis, being present in every single psoriatic plaque. Detection of any other morphologic type of vessels excludes the diagnosis of PP. The term “red globulesThis glossary term has not yet been described.” has also been used to describe the same dermoscopic feature. Distinction between dots and globules is based on the diameter of the structure (dots are smaller), and it is important in dermoscopy of melanocyticThis glossary term has not yet been described. tumors. In psoriasis, both terms may be used, since the roundish vascular structures can be of various diameters, although they are usually of similar size within a given lesion. Under higher magnifications (x100-x400), the psoriatic vessels appear as dilated, elongated, and convoluted capillaries. Histopathologically, red dots correspond to the loops of vertically arranged vessels within the elongated dermal papillae. Dermoscopic findings of psoriasis may vary dependent of the body sitedescribes the area of the body and the various amounts of scaling. In psoriatic balanitis and inverse psoriasis lesions that lack scaling, the regularly distributed red dots are prominent. Contrariwise, in scalpThis glossary term has not yet been described. or palmoplantar psoriasis, thick hyperkeratotic plaques hide the typical vascular structures, which may be recognized after removal of the scales. Regular dermoscopic examination is of avail in patients under treatment with topical steroids or systemic biological agents, because additional morphologic information might be helpful for early detection of a relapse. Additionally, steroid-induced skin atrophy is earlier detected by dermoscopy (by revealing characteristic linear vessels) than in the clinical setting. Dermatitisalso known as eczema is a group of diseases that results in inflammation of the skin. Despite their variable etiopathologies, all forms of dermatitis show similar histopathologic just as similar dermoscopic characteristics. Dermatitis usually exhibits red dots in a patchy distribution and yellow scales. The red dots are identical to the vessels in psoriatic lesions, but unlike psoriasis, their distribution is not homogenous and regular, but rather clustered, generating an irregular, “patchy” pattern. Lichen planusThis glossary term has not yet been described. White crossing streakslines radial (always at periphery) streaks Reed nevus melanoma recurrent nevus (Wickham striae) are the hallmark of lichen planus not only in clinical examinationThis glossary term has not yet been described. (particularly in mucous lesions), but also in dermoscopy. White crossing streaks are a specific, as well as a constant finding for lichen planus, irrespectively of lesion’s duration or subtype. VesselsThis glossary term has not yet been described. of mixed morphology (dotted and linear) may be found at the periphery of the lesion. The two major dermoscopic features of pityriasis rosea are yellowish background color and peripheral whitish scales. Besides, dotted vessels may be detected in dermoscopy of most pytiriasis rosea lesions, as seen in psoriasis and dermatitis. However, the vascular pattern lacks the characteristic regular distribution of psoriasis. In disseminated superficial actinic porokeratosis, the peripheral track may be hyperpigmentedThis glossary term has not yet been described.. Depending on the disease subtype and the stage of progression, the central part of porokeratotic lesions can demonstrate a brownish pigmentation, dotted or linear vessels, or a structureless whitish area. By dermoscopy, the diagnosis of porokeratosis is performed without difficulty, even in clinically atypical cases. In dermoscopy, the presence of orange-yellowish globules or areas and linear vessels are highly suggestive of dermal granulomas and therefore easily allows the diagnosis of granulomatous skin diseases. However, their differential diagnosis remains challenging due to identical dermoscopic presentationThis glossary term has not yet been described. produced by several causes. Notably, the plaque form of cutaneous sarcoidosis may resemble necrobiosis lipoidica. The longer and more branching telangiectasias of necrobiosis lipoidica, caused by atrophic changes not present in cutaneous sarcoidosis, were reported to be an important feature for discrimination from other granulomatous diseases. In sarcoidosis  and lupus vulgaris, orange-yellowish translucent globular-like or structureless areas in combination with linear vessels have been described, which are suggested to correspond to the underlying granulomas. Granuloma anulare may reveal a high variability of dermoscopic findings. Vessels may be dotted, short linear or linear arborizing, while background color displays various combinations of red, white and yellow. In certain cases, pigmented structures may be detected. The observation that granuloma anulare rarely exhibits features of other granulomatous skin diseases, such as necrobiosis lipoidica or sarcoidosis, might helpRefers to giving assistance or support to others for mutual benefit clinicians rule out the latter conditions. Necrobiosis lipoidica exhibits a characteristic and repetitive pattern, typified by a prominent network of linear arborizing vessels and a yellow background colorColor (American English) or colour (Commonwealth English) is the characteristic of human visual perception described through color categories, with names such as red, yellow, purple, or blue.. The prominent vascular network of necrobiosis lipoidica represent the most valuable feature for differential diagnosis from other granulomatous diseases. This typical vascular morphology should be differentiated from the classical ‘arborizing' vessels of nodularThis glossary term has not yet been described.-cystic basal cell carcinoma. Classical arborizing vessels usually reveal ramifications into finest capillaries, while vessels in necrobiosis lipoidica exhibit only few diameter variegations and reveal multiple anastomosing ramifications. Ulcerations and yellow crusts represent the most common additional features. Dermoscopic criterias differ depending on the stage of progression of discoid lupus erythematosus. In early lesions, perifollicular whitish halo, follicular plugging and white scales are the predominant features, while in longer-standing lesions telangiectatic vessels, pigmentation structures and whitish structureless areas prevail. This distinct dermoscopic pattern is useful for discriminating discoid lupus erythematosus from lupus pernio (cutaneous sarcoidosis) and lupus vulgaris (cutaneous tuberculosis). The latter diseases lack the predominant follicular abnormalities of discoid lupus erythematosus, and display a characteristic pattern consisting of orange-yellowish areas/globules and branching arborizing vessels. RosaceaThis glossary term has not yet been described. Rosacea is characterized by a unique dermoscopic vascular pattern of polygonal vessels. Since this pattern of dermoscopic vascular polygons is not present in any other skin disease, this is a sensitive criterion for the diagnosis of rosacea. Regarding the accuracy in evaluation of vascular alterations by dermoscopy, the technique may be additionally useful for follow up of rosacea. Additional dermoscopic findings of rosacea include follicular plugs, white scales, features related to the presence of demodex (“demodex tails”) and whitish amorphic follicular material. However, the frequency of these additional criteria is relatively low. In papulopustular rosacea, clinically non-visible pustules provide a useful dermoscopic clue for discrimination from lupus erythematosus, but this requires further investigation. The predominant dermoscopic feature of lichen sclerosus are white-yellowish structureless areas, independently of the location. Genital lichen sclerosus commonly appear with linear vessels while extragenital lesions rather exhibit keratotic plugs, surrounded by an erythematous halo. This halo represents a marker of disease activity. In morphea, linear vessels within the lilac ring are a typical finding in dermoscopy. By dermoscopical examination, lichen sclerosus is typified by comedo-like openings[[Comedo like openings]] and whitish patches, whereas morphea exhibits fibrotic beams. Urticaria and urticarial vasculitisThis glossary term has not yet been described. Common urticaria is dermoscopically characterized by a red, reticular network of linear vessels, which may be surrounded by an area devoid of vessels, corresponding to dermal edema. On the contrary, urticarial vasculitis dermoscopically exhibit purpuric dots or globules on an orange-brown background. Both diseases reveal no highly specific criteria, but the presence of purpuric dots is suggestive of an underlying vasculitis. The term pigmented purpuric dermatoses comprehends the following entities: Schamberg’s disease, Majocchi purpura, eczematoid purpura of Doucas and Kapetanakis, lichen aureus and pigmented purpuric lichenoid dermatitis of Gougerot-Blum. Pigmented purpuric dermatoses are dermoscopically identified by the combination of purpuric dots or globules and orange-brown areas of pigmentation. A similar dermoscopic pattern has been described in patients with mycosis fungoides, supporting previous evidence reporting clinical and histopathologic overlap between the two entities. Since the pigmented purpuric dermatoses and mycosis fungoides notably differ in physical course and managementThis glossary term has not yet been described., lesions showing a dermsocopic pattern of pigmented purpuric dermatoses should be evaluated carefully. In Darier’s disease, dermoscopical analysis highlights the characteristic pseudocomedones and therefore is an effective additional tool for its clinical recognition. Vascular patternsThis glossary term has not yet been described. are unspecific, comprising erythema, dotted and linear vessels. For cutaneous mastocytosisis a form of mastocytosis that primarily affects the skin. There are three main forms of the condition: maculopapular cutaneous mastocytosis (also called urticaria pigmentosa), solitary cutaneous mastocytoma, and diffuse cutaneous mastocytosis. There is also an exteremely rare form called telangiectasia macularis eruptiva perstans. The signs, symptoms and severity of the condition vary by subtype. four dermoscopic patterns have been defined: light-brown blot, pigment networkGrid-like pattern consisting of interconnecting pigmented lines surrounding hypopigmented holes., reticular vascular pattern, and yellow-orange blot. Dermoscopic pattern varies depending on the subtype : In maculopapular mastocytosisThis glossary term has not yet been described., light-brown blot and pigment network predominate. In solitary mastocytoma, a yellow orange blot is typical. In all cases of telangiectasia macularis eruptiva perstans, a reticular vascular pattern is present. The reticular pattern of the vessels is even proved associated with an increased risk of need for daily use of anti-mediator medication. Therefore, dermoscopy in combination with other variables could provide additional help in the identification of patients at risk for more severe symptoms. In granuloma faciale, the specific dermoscopic features are dilated follicular openings, perifollicular whitish halo, follicular keratotic plugs and linear branching vessels. Clinically, granuloma faciale has to be differentiated from sarcoidosis, discoid lupus erythematosus, lupus vulgaris, lymphomaThis glossary term has not yet been described. and basal cell carcinoma. The mentioned dermoscopic patterns simplify clinical differential diagnosis. But the distinction from discoid lupus erythematosus, which exhibits similar findings, remains challenging. Even if being a neoplastic disease, mycosis fungoides is listed in this article as a major differential diagnosis from several inflammatory skin disorders. In particular, differentiation between chronic dermatitis and early stage mycosis fungoides is often highly problematic. In dermoscopical studies, significant differences have been shown: In contrast to the dotted vessels in dermatitis, mycosis fungoides reveal short linear vessels and orange-yellowish areas. In addition, in mycosis fungoides a peculiar vascular structure is frequently observed consisting of a dotted and a linear component (spermatozoon-like structure). In the assessment of a chronic lesion previously diagnosed as dermatitis, dermoscopic examination is expected to reveal dotted vessels, occasionally combined with yellowish scales. Lesions under long-term treatment with topical steroids represent the only exception to this rule. When, instead, dermoscopy reveals linear vessels, the suspicion of mycosis fungoides rises strongly and in this case, patient’s management should be adjusted accordingly. ↑ 1.01.11.21.31.41.51.61.7 Lallas et al. : Accuracy of dermoscopic criteria for the diagnosis of psoriasis, dermatitis, lichen planus and pityriasis rosea. Br. J. Dermatol. 2012;166:1198-205. PMID: 22296226. DOI. ↑ 2.02.1 Vázquez-López et al. : Dermoscopic features of plaque psoriasis and lichen planus: new observations. Dermatology (Basel) 2003;207:151-6. PMID: 12920364. DOI. ↑ 8.08.1 Vázquez-López et al. : Dermoscopic semiology: further insights into vascular features by screening a large spectrum of nontumoral skin lesions. Br. J. Dermatol. 2004;150:226-31. PMID: 14996092. ↑ 9.09.19.2 Lallas et al. : Dermoscopy of early stage mycosis fungoides. J Eur Acad Dermatol Venereol 2013;27:617-21. PMID: 22404051. DOI. ↑ Chuh &: Collarette scaling in pityriasis rosea demonstrated by digital epiluminescence dermatoscopyThe examination of [skin lesions] with a 'dermatoscope'. This traditionally consists of a magnifier (typically x10), a non-polarised light source, a transparent plate and a liquid medium between the instrument and the skin, and allows inspection of skin lesions unobstructed by skin surface reflections. Modern dermatoscopes dispense with the use of liquid medium and instead use polarised light to cancel out skin surface reflections.. Australas. J. Dermatol. 2001;42:288-90. PMID: 11903165. ↑ Chuh &: The use of digital epiluminescence dermatoscopy to identify peripheral scaling in pityriasis rosea. Comput Med Imaging Graph 2002;26:129-34. PMID: 11818191. ↑ 14.014.1 Abdel-Azim et al. : Differentiation of pityriasis rubra pilaris from plaque psoriasis by dermoscopy. Arch. Dermatol. Res. 2017;309:311-314. PMID: 28280914. DOI. ↑ Delfino et al. : Dermoscopy for the diagnosis of porokeratosis. J Eur Acad Dermatol Venereol 2004;18:194-5. PMID: 15009303. ↑ 24.024.1 Pellicano et al. : Dermoscopy of cutaneous sarcoidosis. Dermatology (Basel) 2010;221:51-4. PMID: 20375489. DOI. ↑ Bakos et al. : DermatoscopyThe examination of [skin lesions] with a 'dermatoscope'. This traditionally consists of a magnifier (typically x10), a non-polarised light source, a transparent plate and a liquid medium between the instrument and the skin, and allows inspection of skin lesions unobstructed by skin surface reflections. Modern dermatoscopes dispense with the use of liquid medium and instead use polarised light to cancel out skin surface reflections. of early-onset necrobiosis lipoidica. J. Am. Acad. Dermatol. 2012;66:e143-4. PMID: 22421129. DOI. ↑ 26.026.1 Balestri et al. : Dermoscopic subpatterns of granulomatous skin diseases. J. Am. Acad. Dermatol. 2013;69:e217-8. PMID: 24124838. DOI. ↑ 27.027.127.2 Pellicano et al. : Dermoscopy of necrobiosis lipoidica and granuloma annulareThis glossary term has not yet been described.. Dermatology (Basel) 2013;226:319-23. PMID: 23797090. DOI. ↑ 28.028.1 Brasiello et al. : Lupus vulgarisThis glossary term has not yet been described. : a new look at an old symptom--the lupoma observed with dermoscopy. Dermatology (Basel) 2009;218:172-4. PMID: 19060460. DOI. ↑ 30.030.1 Bakos et al. : Dermatoscopy of early-onset necrobiosis lipoidica. J. Am. Acad. Dermatol. 2012;66:e143-4. PMID: 22421129. DOI. ↑ Lallas et al. : Dermoscopy of discoid lupus erythematosus. Br. J. Dermatol. 2013;168:284-8. PMID: 22985425. DOI. ↑ Segal et al. : Dermoscopy as a diagnostic tool in demodicidosisThis glossary term has not yet been described.. Int. J. Dermatol. 2010;49:1018-23. PMID: 20931672. ↑ Vázquez-López et al. : Dermoscopy for the screening of common urticaria and urticaria vasculitisThis glossary term has not yet been described.. Arch Dermatol 2008;144:568. PMID: 18427065. DOI. ↑ Zaballos et al. : Dermoscopy of pigmented purpuric dermatoses (lichen aureus): a useful tool for clinical diagnosis. Arch Dermatol 2004;140:1290-1. PMID: 15492206. DOI. ↑ Zalaudek et al. : [Atypical clinical presentation of pigmented purpuric dermatosis]. J Dtsch Dermatol Ges 2006;4:138-40. PMID: 16503941. DOI. ↑ Vázquez-López et al. : The handheld dermoscope improves the recognition of giant pseudocomedones in Darier's diseaseis an autosomal dominant disorder discovered by French dermatologist Ferdinand-Jean Darier. Darier's is characterized by dark crusty patches on the skin, sometimes containing pus. The crusty patches are also known as keratotic papules, keratosis follicularis or dyskeratosis follicularis. Mild forms of the disease are the most common, consisting solely of skin rashes that flare up under certain conditions such as high humidity, high stress or tight-fitting clothes. Even in mild forms, short stature combined with poorly formed fingernails containing vertical striations are diagnostic.. J. Am. Acad. Dermatol. 2004;50:454-5. PMID: 14988691. DOI. ↑ 42.042.1 Vano-Galvan et al. : Dermoscopic features of skin lesions in patients with mastocytosis. Arch Dermatol 2011;147:932-40. PMID: 21844452. DOI. ↑ Ohnishi et al. : Angioma serpiginosumis a skin condition in which there are small blood vessels near the skin surface. It presents as small red dots (puncta) that cluster together to form a linear or snake-like array (serpiginous pattern) or ring-shaped (gyrate) pattern. : a report of 2 cases identified using epiluminescence microscopy. Arch Dermatol 1999;135:1366-8. PMID: 10566835. This page was last modified on 28 November 2018, at 09:06.